Check-in time is 2:00PM. Check-out time is 12:00PM. Late check-out will be charged Php 500.00 for every hour for three hours. The fourth hour will be charged another night. Bringing of pets is strictly prohibited. Proper swimming attire i.e. swimming trunks/shorts, swimsuits are required. Children 12 years old and above are considered adults and shall be charged the extra person rate of Php 1,500.00 with bed and breakfast or Php 1,300.00 extra bed only. Only 2 kids (11 and below) are allowed to stay using existing beds for free per room. A credit card or a refundable security deposit of Php 2,000.00 per room is required for incidentals upon check-in. Bookings can no longer be cancelled or amended. In case of a no-show, the hotel will not refund the booking. WIFI available in common areas (i.e. lobby, 2nd floor veranda, and coffee shop). Our Standard Queen room is perfect for couples looking to disconnect from the daily grind of the city life. 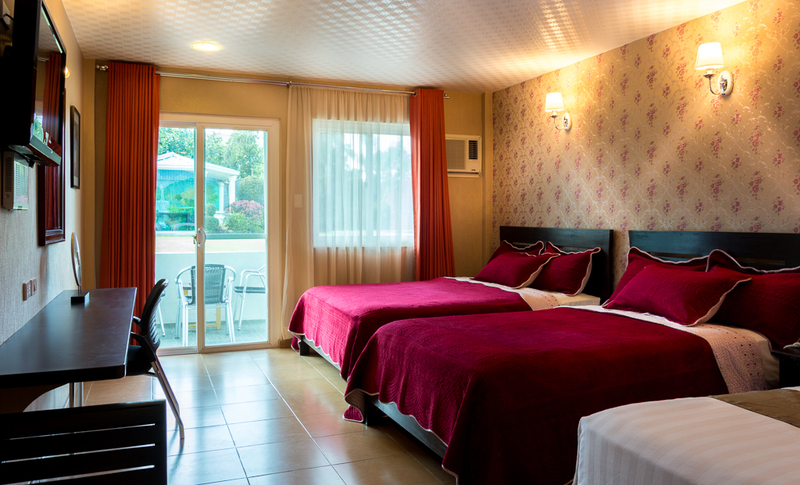 Get pampered with a queen size bed, comfy feather pillows, duvet, air-conditioning, 32" LCD TV, private bathroom with hot and cold shower, mini-bar, mini-ref, complimentary bottled water, and room service. Are you on a business trip with a companion or having a weekend getaway with a friend? 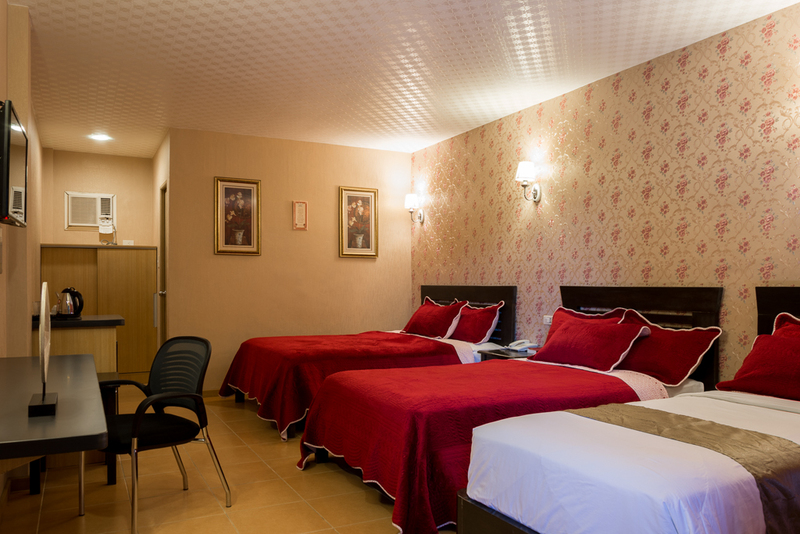 The Standard Twin Room's two single beds will ensure appropriate space between you and your travel buddy. Indulge with two single beds, comfy feather pillows, duvet, air-conditioning, 32" LCD TV, private bathroom with hot and cold shower, mini-bar, mini-ref, complimentary bottled water, and room service. For a small family of three, our Deluxe room is more than enough to guarantee a relaxing weekend at Tagaytay Wingate Manor. This room has a queen size bed and a single bed, comfy feather pillows, duvet, air-conditioning, 32" LCD TV, private bathroom with hot and cold shower, mini-bar, mini-ref, complimentary bottled water, and room service. Our Premier Rooms offer exemplary family friendly accommodation with a queen size bed and a double bed giving accommodation for four adults and two kids. This room is well appointed and feature signature Tagaytay Wingate Manor pillow-top mattresses with comfy feather pillows, duvet, air-conditioning, 32" LCD TV, private bathroom with hot and cold shower, mini-bar, mini-ref, complimentary bottled water, and room service. Our spacious and airy Poolside Premier Rooms can accommodate up to four(4) guests with a queen size bed and a double bed. Located at the garden level, Sliding doors open up to the garden and the swimming pool. Equipped with pleasant furnishings and an alluring color palette, these cozy Poolside Premier rooms are where pleasure and affinity feel right at home. This room is well appointed and feature signature Tagaytay Wingate Manor pillow-top mattresses with comfy feather pillows, duvet, air-conditioning, 32" LCD TV, private bathroom with hot and cold shower, mini-bar, mini-ref, complimentary bottled water, and room service. © 2016 Tagaytay Wingate Manor. All rights reserved.